Above is a woven shibori scarf, 4 shaft Monk’s Belt. I enjoy creating one-of-a-kind scarves by varying the treadling on each one. I am hemstitching these scarves on the loom. Normally I would break up the threading to avoid reed marks, but leaving it has been useful when hemstitching 3 threads in each group. 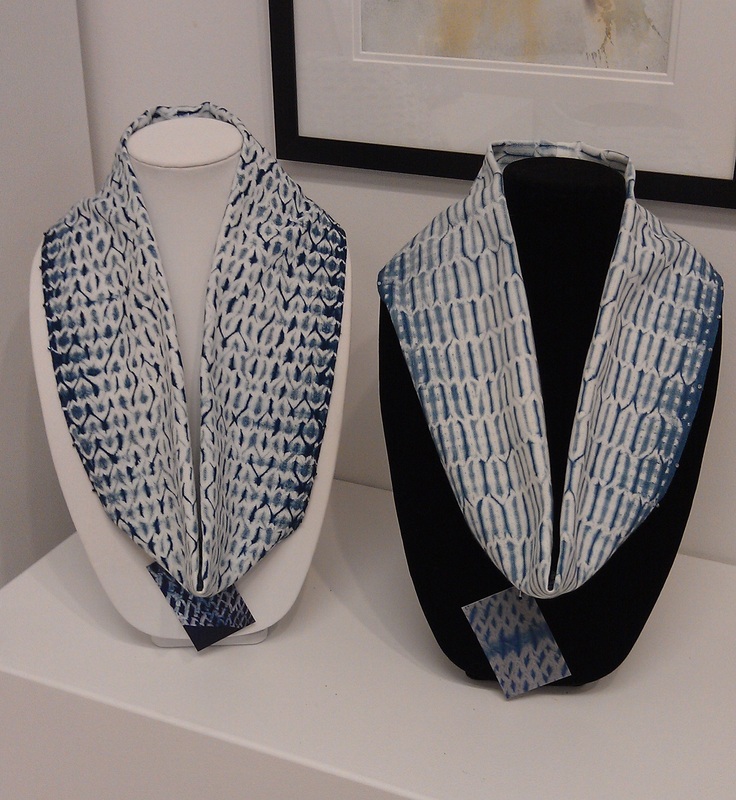 Two recent scarves, variations on a theme.. Both of these scarves are from the same warp, same threading, and were treadled differently for different results. 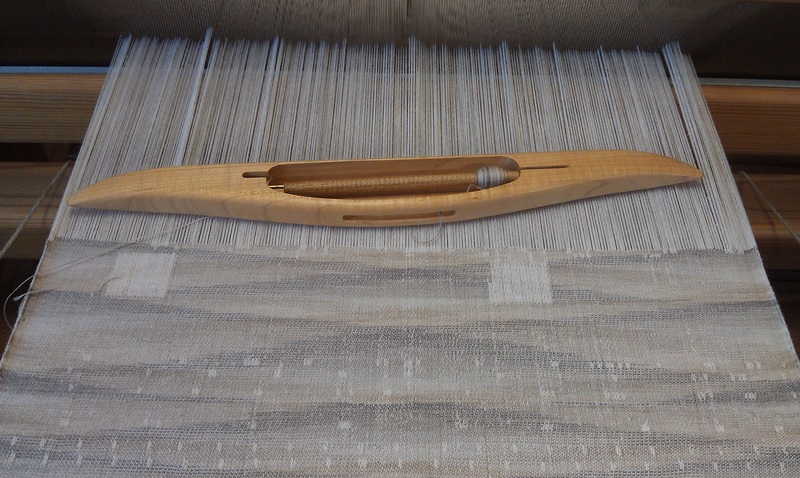 I’m back at work, getting the Glimakra Regina rug/tapestry loom ready to be warped. Heddles and cords were given the “spa” treatment, heddles were clipped apart, and put on two shafts. The shafts were then fastened to the loom. 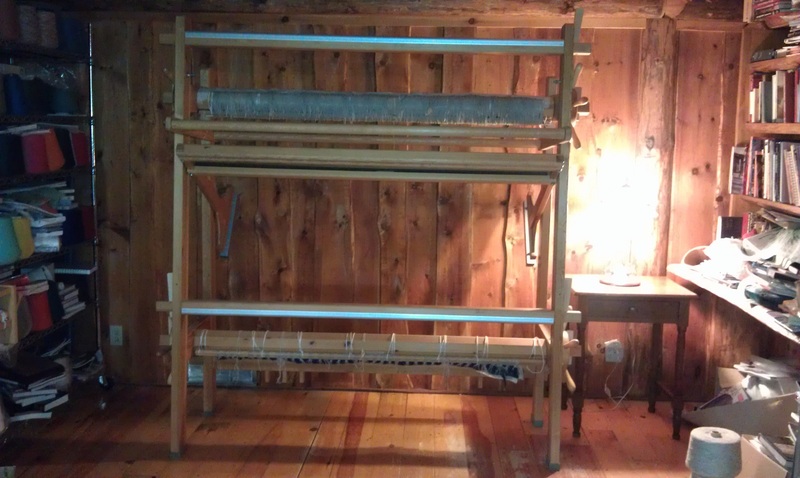 All that is left is to add the treadles, remove remnants of the old warp, make a new warp, and beam/thread/sley it. And then WEAVE! 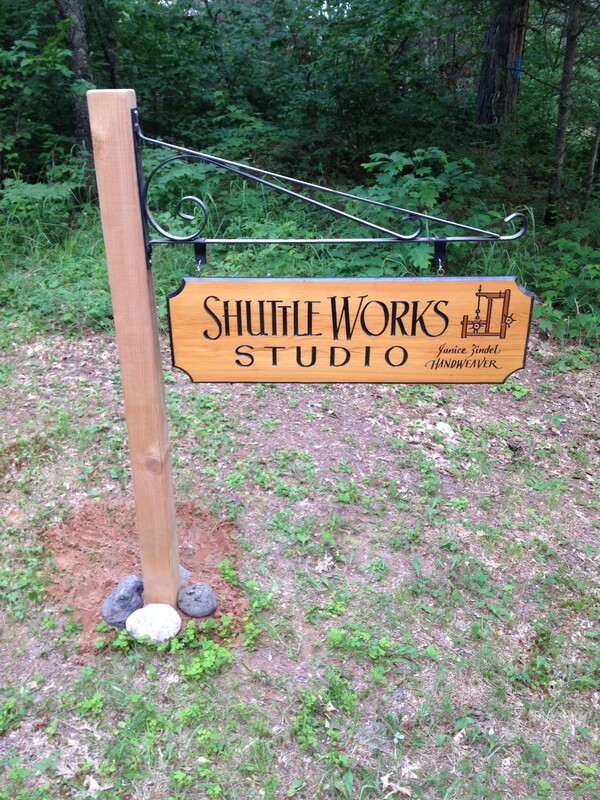 It was time to declutter and clean the studio for the summer Northwoods Art Tour. 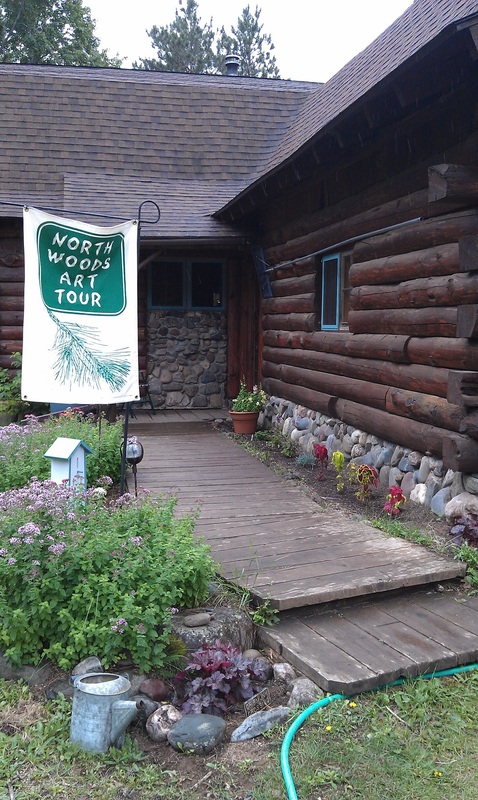 Northwoods Art Tour banner near the entry. The studio was decluttered, books shelved, cones of yarn put in order, weaving displayed. 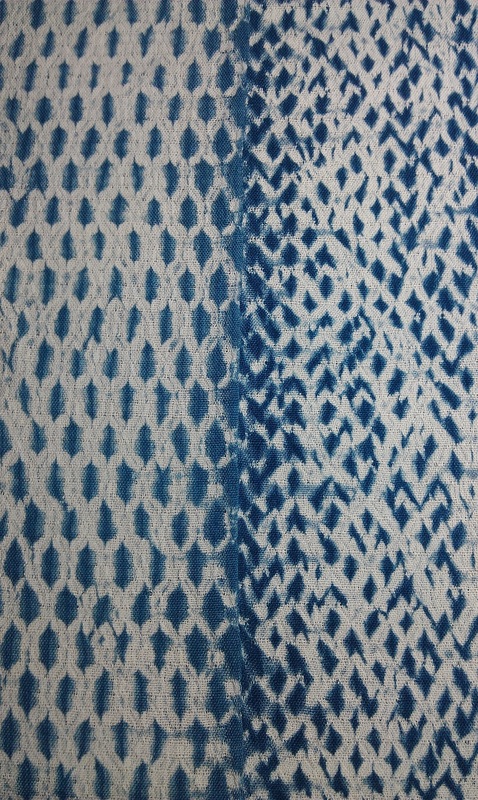 The Glimakra Standard had woven shibori in progress, along with a scarf that had been indigo dyed and still gathered and tyed, with only a few knots removed to show the resulting fabric as a demo. 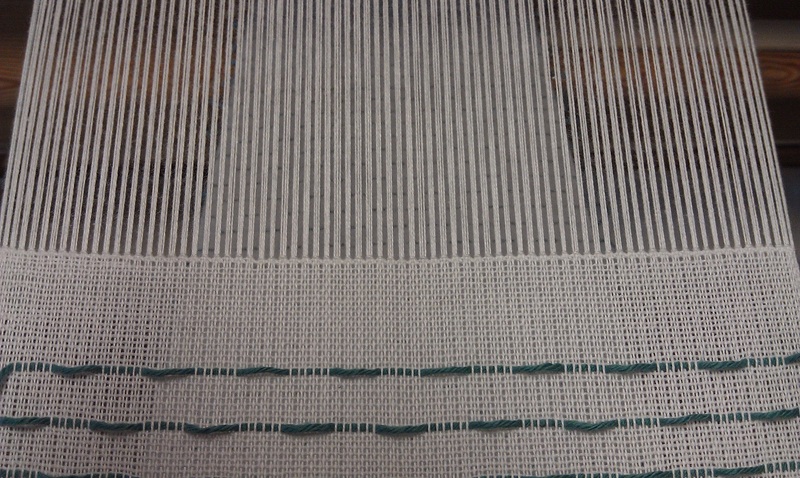 The Glimakra single unit drawloom had demo weaving in progress. 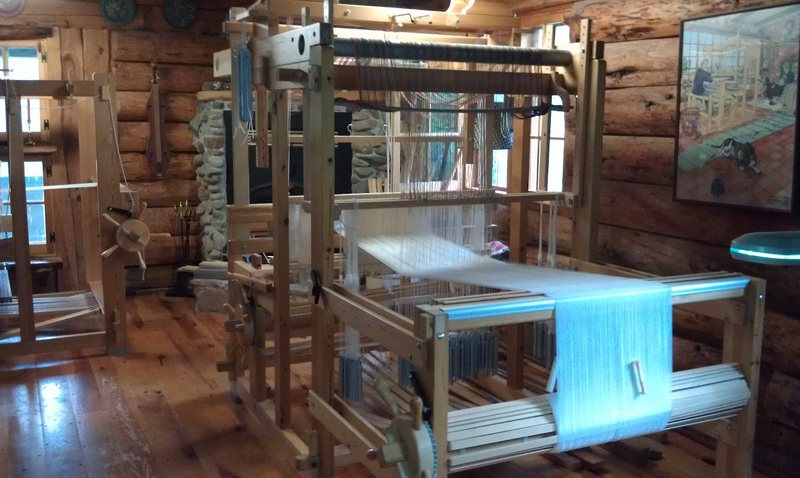 It was rather frustrating to weave on as the humidity was so high warp threads were sticking together, making it difficult to get a clear shed. 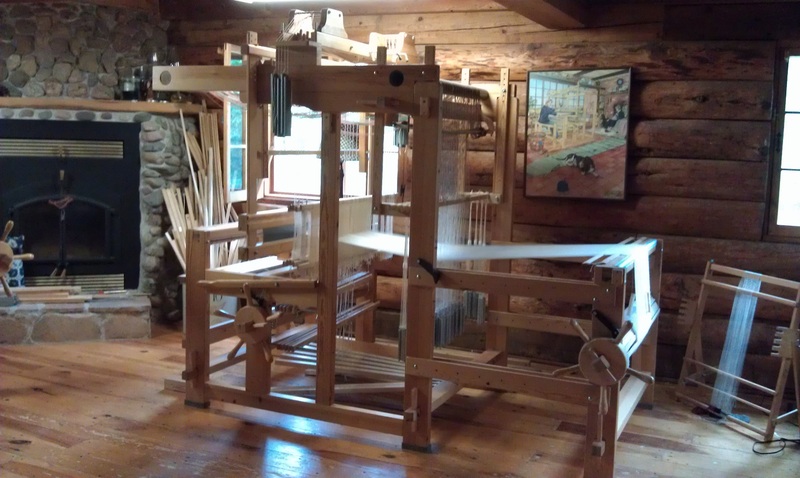 Visitors found the loom fascinating. Glimakra Regina and band loom. 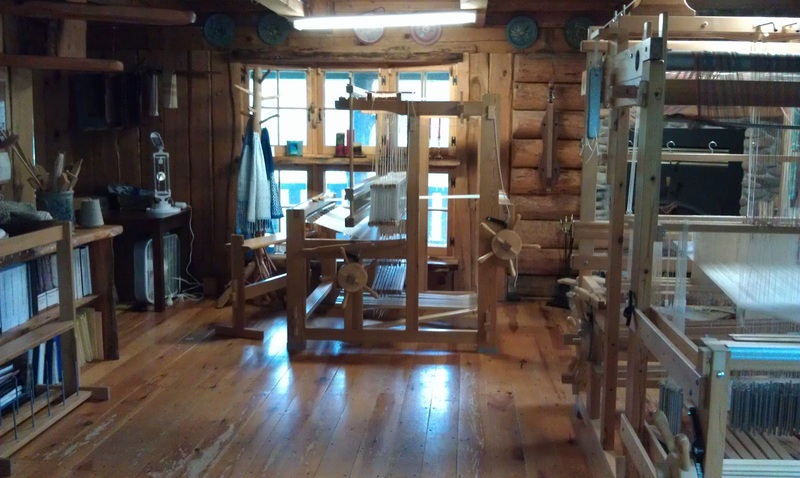 The north end of the room was set up for more demos – band loom, spinning, and the 1908 Gearhart sock machine. Many wanted to see everything in action. 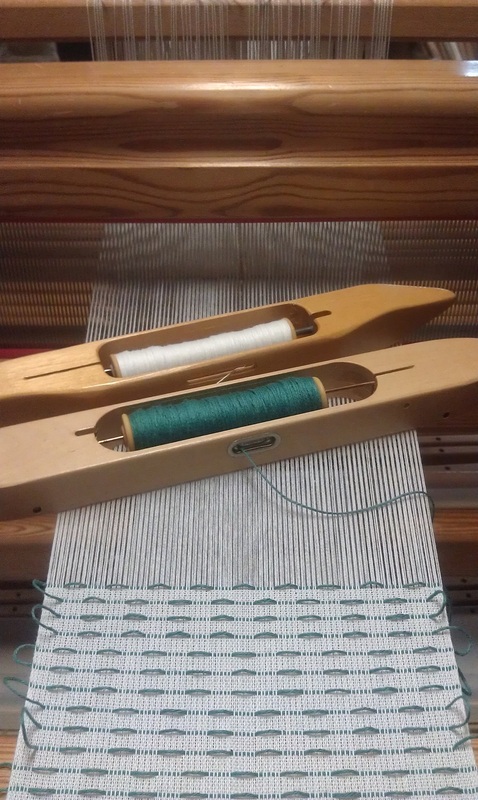 Demo weaving on the drawloom. Despite the threads sticking due to high humidity, I was very pleased with the “landscape” effect of the variegated yarn I decided to try that first morning, and I’ll be working with that more. Chatting with art tour visitors, sharing my love of weaving and fiber arts, and answering questions is always a pleasure. 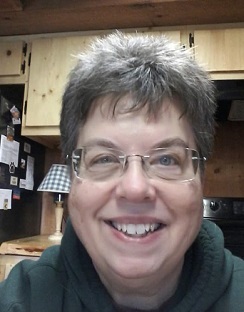 And now it is time to start preparing for our guild demo/sale event, October 4th, during CranberryFest weekend; the Fall Northwoods Art Tour, Oct. 10-12, and our first annual Northwoods Artisan Women Open Studio/Holiday Art Show, on November 15th. 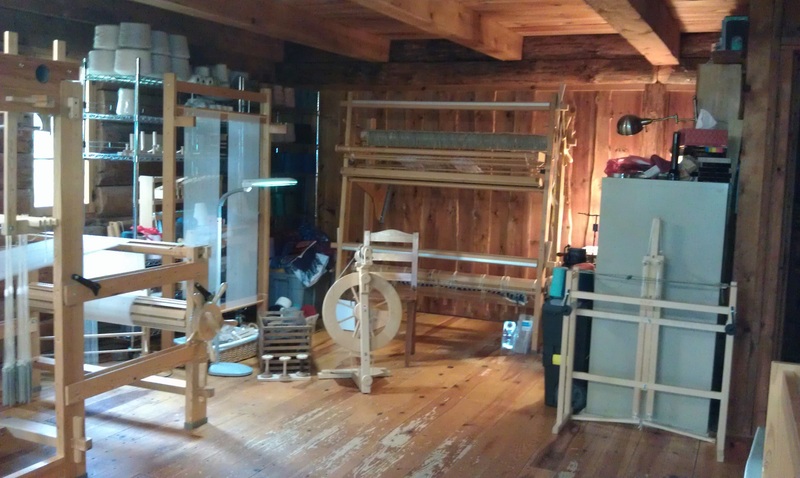 There is a lot of weaving to be done and socks to be made, wonderful hours in Shuttle Works Studio.